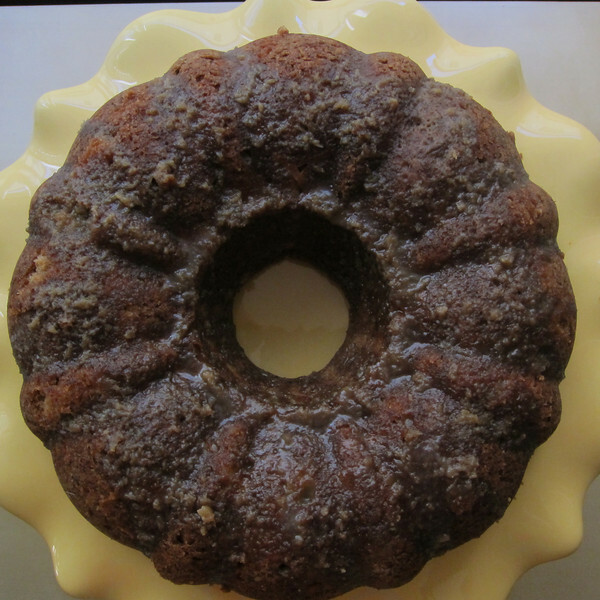 …you black-out that apple cake you made. Apples! I’m talking about apples…what did you think I was talking about? 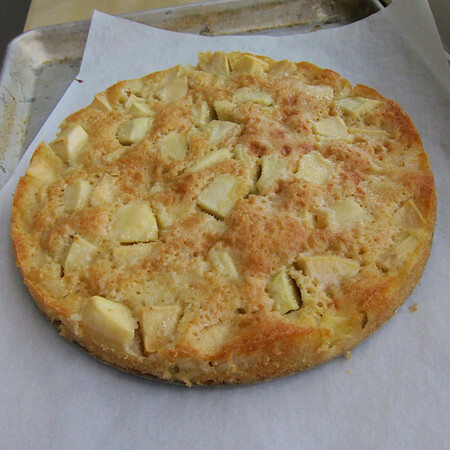 So frenzied and absorbing has my baking with apples been in the last few weeks that I actually forgot about this apple cake. 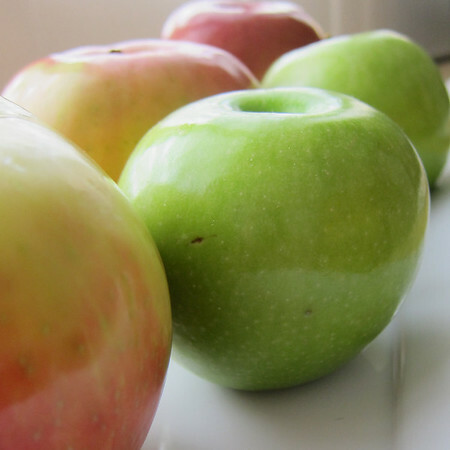 This is the last apple recipe. I promise. I have to admit, what first drew me to this recipe was the opportunity to shred things with my food processor. 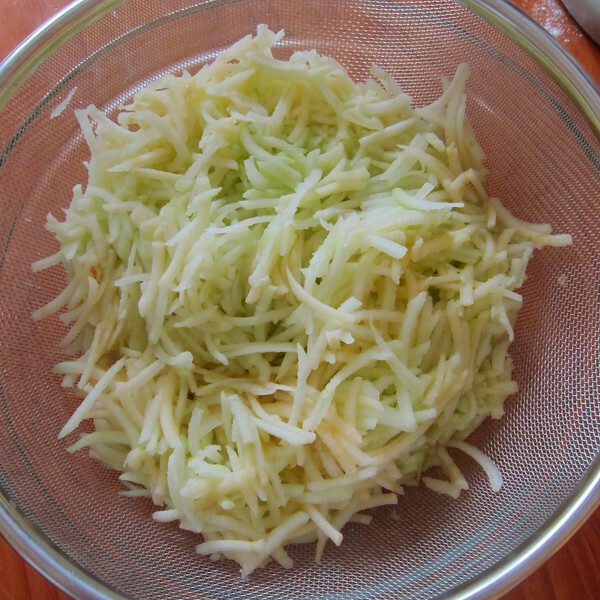 The shredded apples get set aside for a bit in a colander. Then, you get to abuse them further by squeezing them with a towel. In addition to being incredibly satisfying, the shredding and squeezing helps to remove excess liquid (yeah, I know, also known as apple juice). 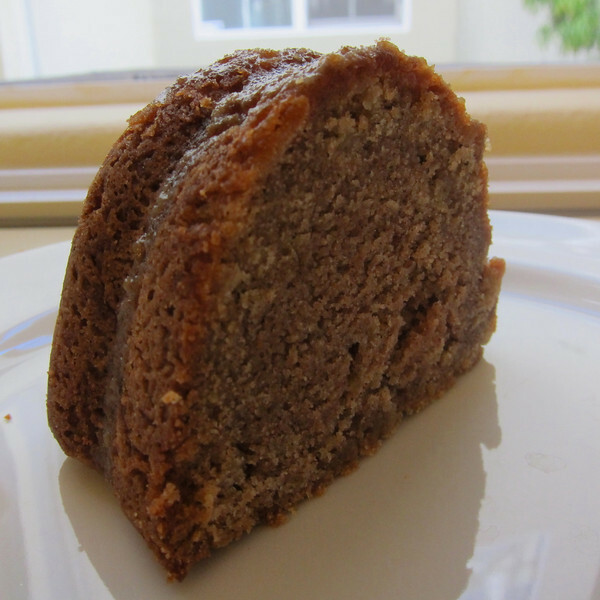 This is a spice-based cake. 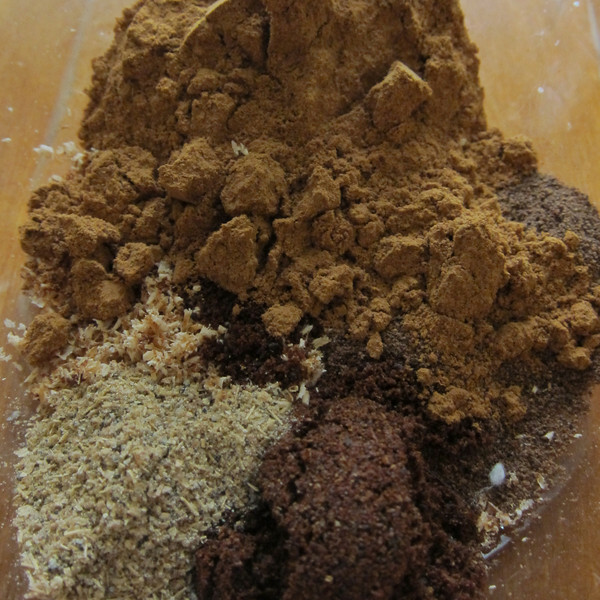 Cinnamon, all-spice, clove, nutmeg and because I couldn’t resist, just a touch of cardamon. The batter is substantial. 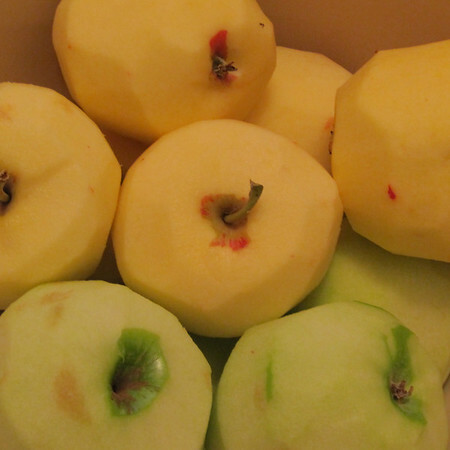 The apples form a sort of matrix that locks-in the moisture. The cake would be lovely if you just stopped here. But why? 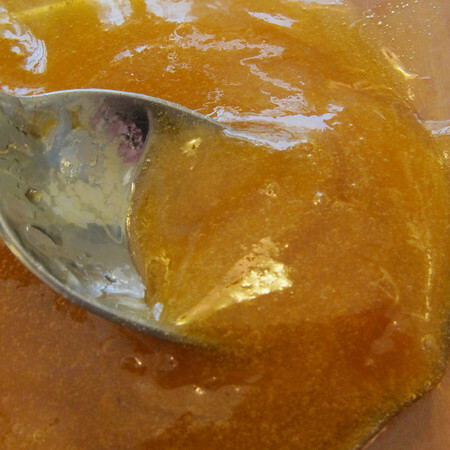 The glaze comes together with brown sugar, butter, a bit of whipping cream and lemon. Let it bubble for a while. And then douse the cake in it. The flavors in this cake taste like autumn to me. Rich, complex and nearly irresistible a la mode or a dollop of gently sweetened whipped cream. This cake would also make a nice edition to Thanksgiving dinner (and you could easily make it ahead…bonus!). Position rack in center of oven and preheat to 325F. Spray 12-cup Bundt pan with nonstick spray. Sift flour and next 6 ingredients into medium bowl. Drain grated apples in strainer. 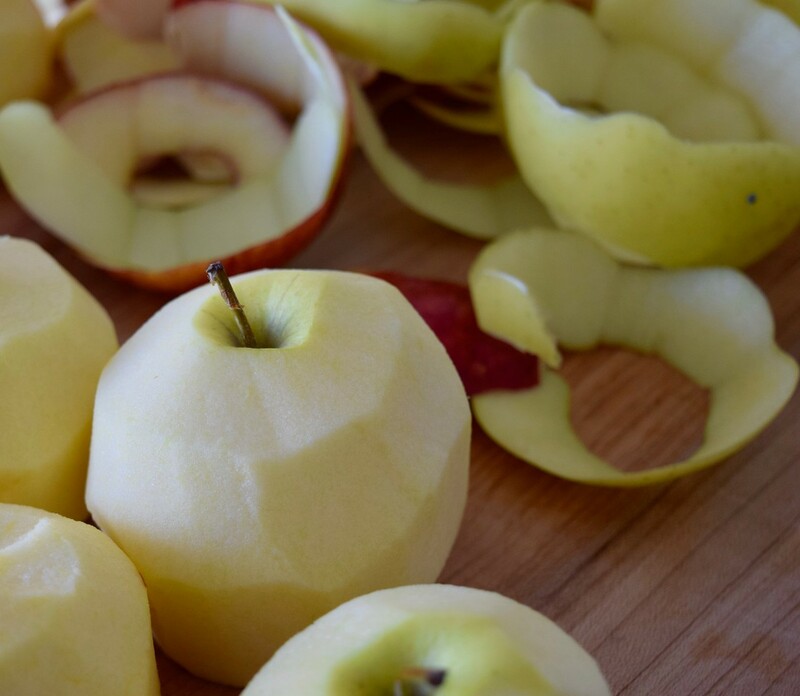 Using hands or kitchen towel, squeeze out excess liquid from apples. 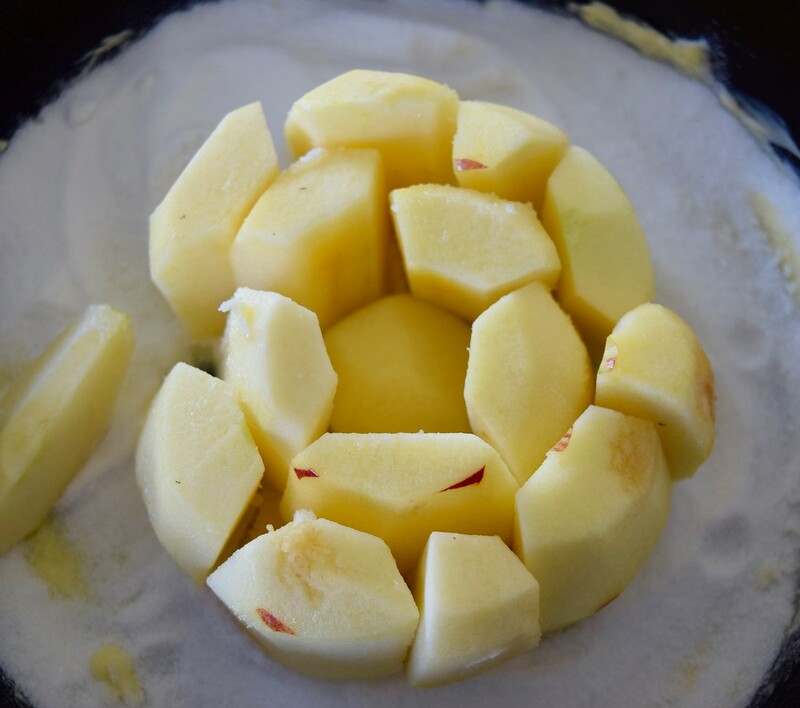 Measure 2 cups grated apples. 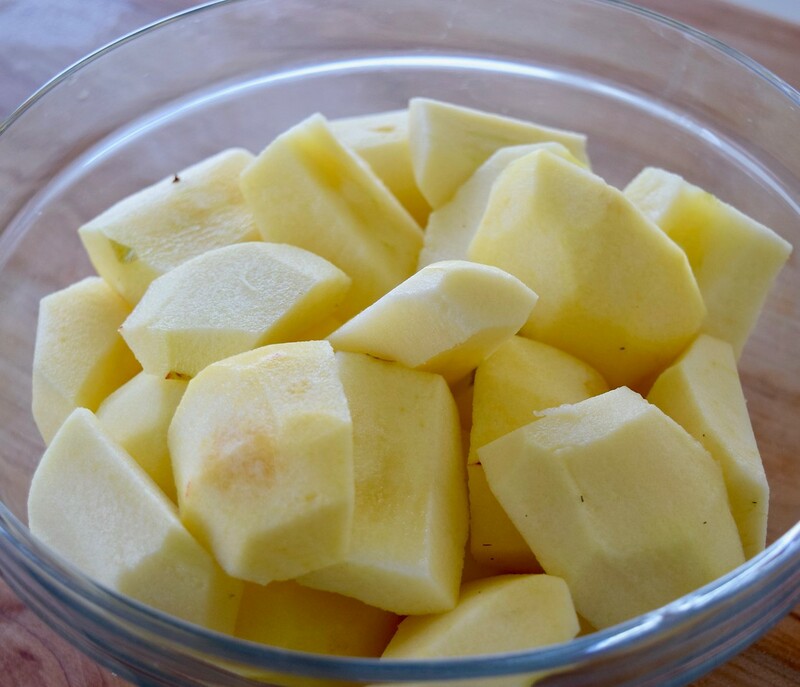 Using electric mixer, beat butter, both sugars, and lemon peel in large bowl until fluffy. Beat in eggs, 1 at a time. Mix in vanilla and lemon juice. 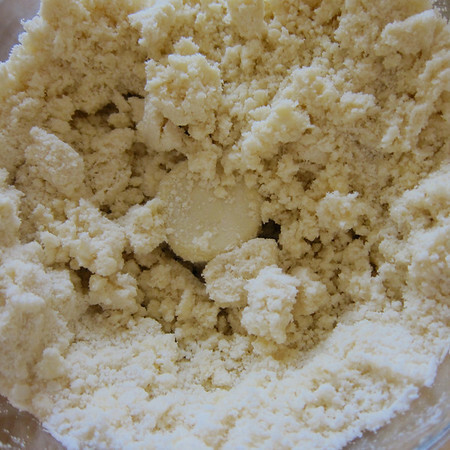 Beat in flour mixture. 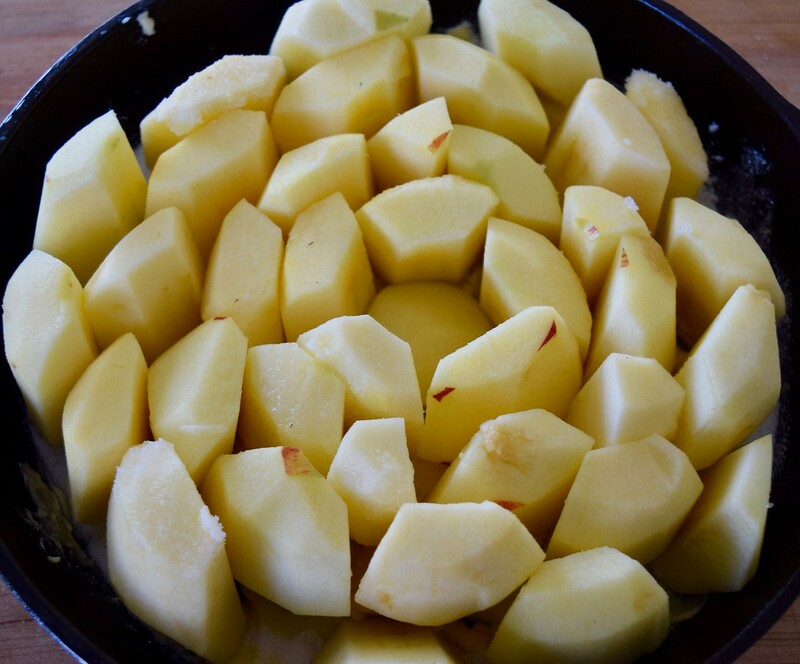 Mix in grated apples. 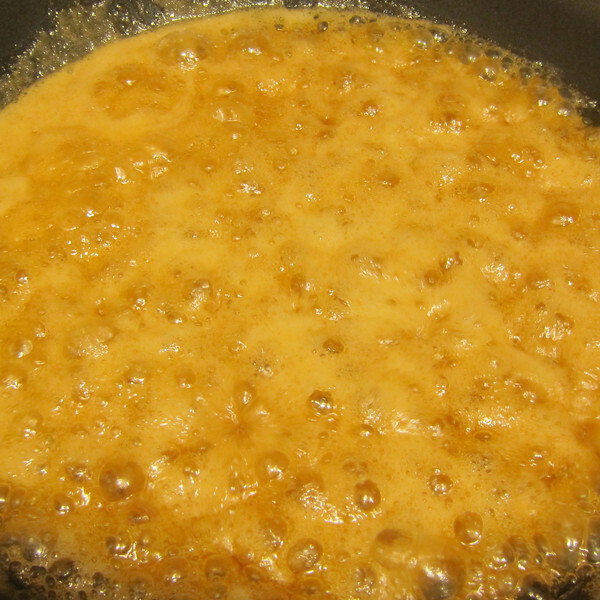 Transfer batter to prepared pan. Bake cake until tester inserted near center comes out clean, about 1 hour. Cool in pan on rack 20 minutes. 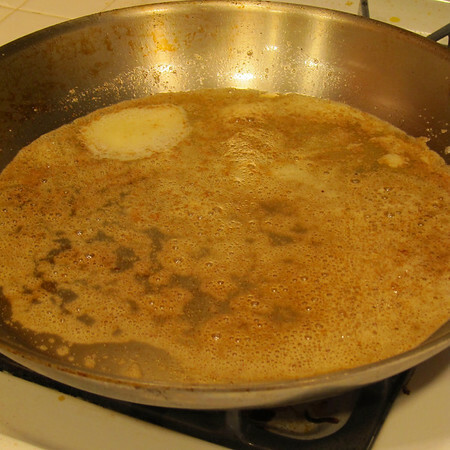 Stir all ingredients in small nonstick skillet over medium-high heat until sugar dissolves and mixture comes to boil. Reduce heat to medium; whisk until glaze is smooth, about 1 minute. Remove from heat. Invert cake onto rack set over baking sheet. 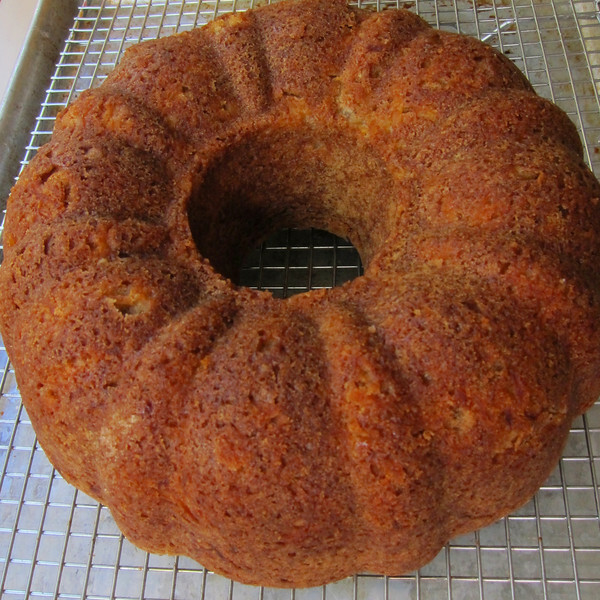 Using small skewer, pierce holes all over top of warm cake. Pour glaze over top, allowing it to be absorbed before adding more. Cool cake 30 minutes. Serve warm or at room temperature. You realize I couldn’t resist saying that right? 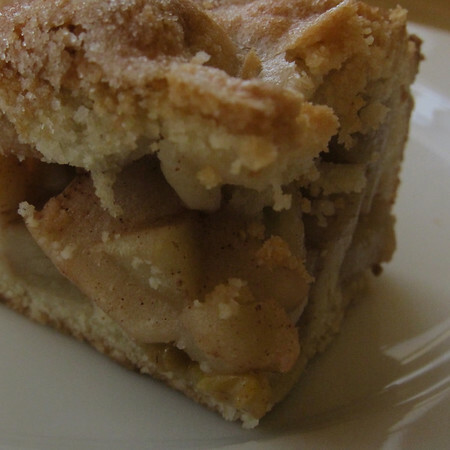 This week we round out the apple-o-rama with a cake that is really a pie. I found this recipe while looking for another in Dorie Greenspan’s Baking from My Home to Yours. It was one of those recipes that I knew I had to try the moment I saw it. 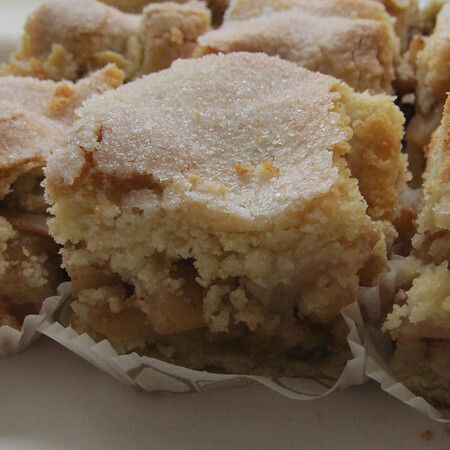 She’s named it Russian Grandmothers’ Apple Pie-Cake after a version her own grandmother made when Dorie was a child. And it has a secret weapon: cookie-like crust. 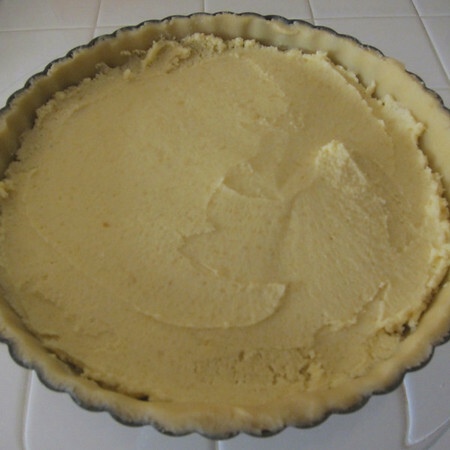 For those of us who continue to fear pie crust, this version is almost as easy as press-in dough. The dough is very much like a butter or even sugar cookie dough. After it is pulled together, it gets a nice cool-down in the fridge and then you roll it out (as always, I suggest this method). But, let’s talk about apples first, shall we? 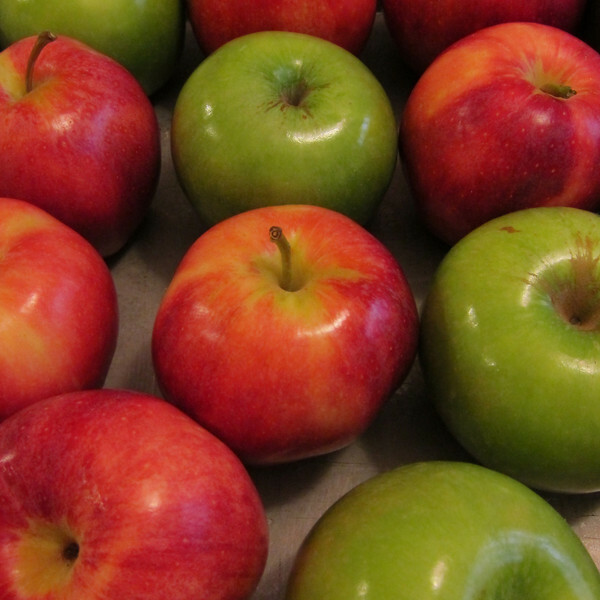 Ms. Greenspan recommends a mix of apples. I concur. 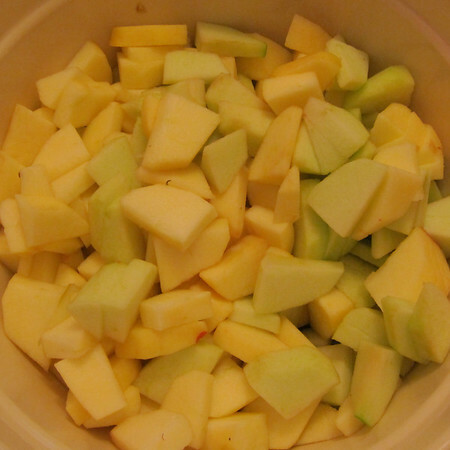 I used a couple of Granny Smiths, some Gala and a Golden Delicious or two to round-out the selection. This recipe calls for 10 apples in all (you can never have too many apples, especially in this recipe). The instructions say to slice these babies in 1/4 inch slices and then halve them if desired. I left mine just a tad chunkier. Before they are set aside to marinate for a bit, the apples get tossed with raisins (I used golden), a little sugar, and some cinnamon. After making this recipe once, I decided that the next go around will include dried cranberries. I think dried cherries would also be fantastic in this recipe. Back to the dough. As you can see, the original version of this recipe utilized a 9X13 inch pan, and you’ll see why in a minute. 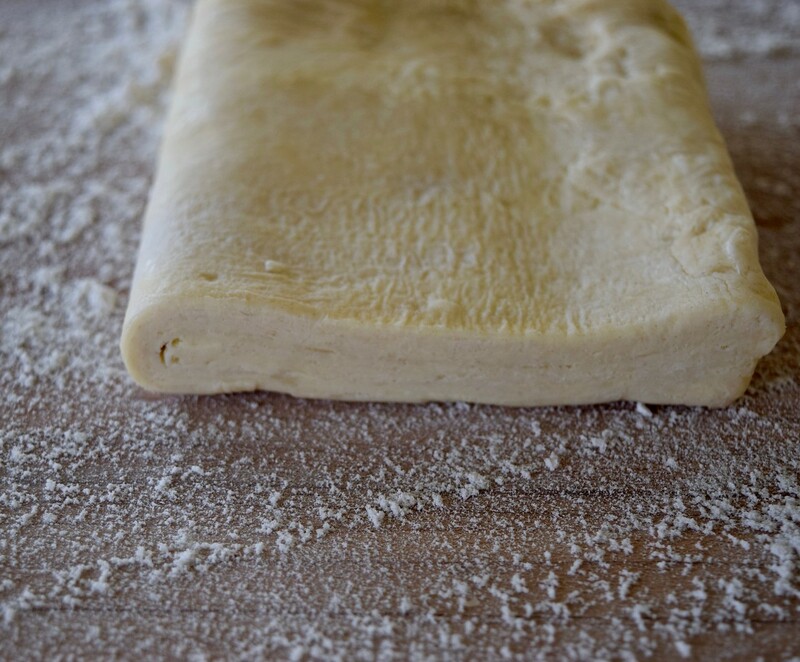 Rolling out a perfect 11X15 inch rectangle of dough isn’t all that easy. 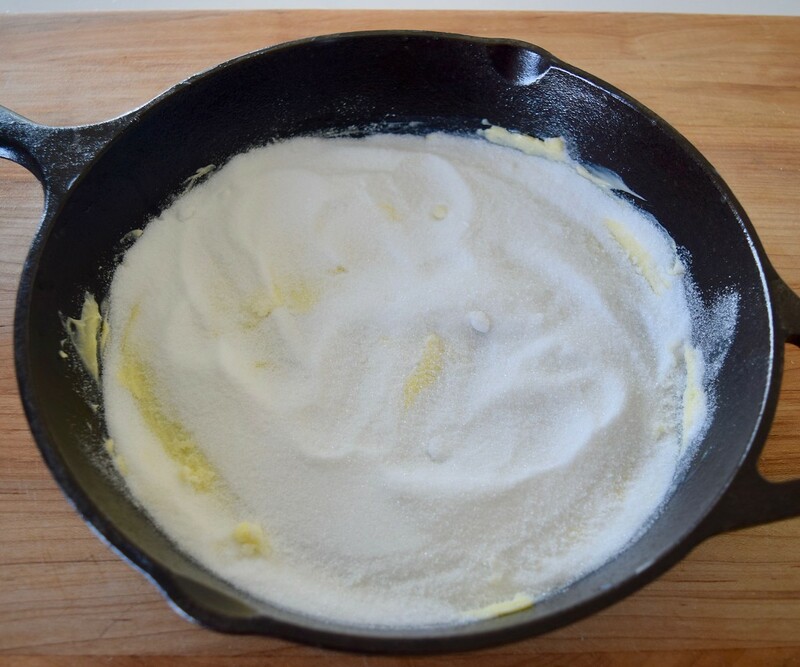 However–because the dough has a leavening agent (aka baking powder), any little cracks or patches in the dough fuse together as if they never happened. For this reason, you can easily piece the dough of the bottom or even top layers together. 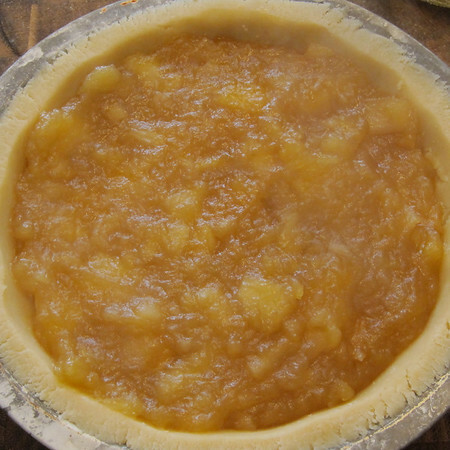 During the baking process the sugar dough and apples sort of mate. 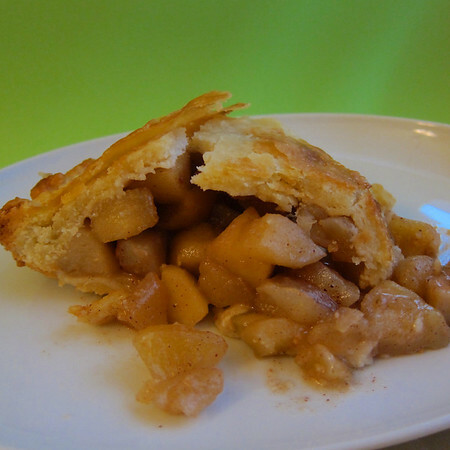 The juices soak into the crusts and the result really is a bit like a pie-cake hybrid. Or at least hybrid enough to cut into squares and still have the pieces maintain their integrity. 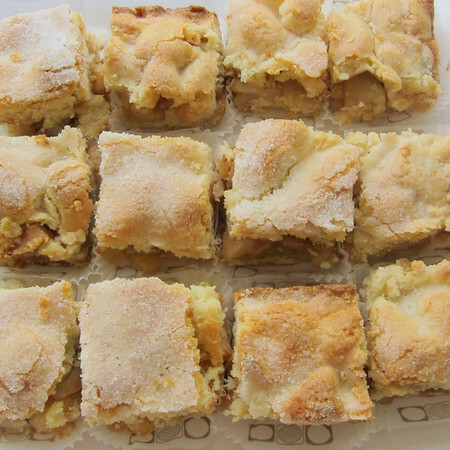 Of all the apple treats I’ve baked over the last month, this one has had the most recipes requests by far. Because of it’s portability and sheer volume of final product, I think this pie-cake would make a perfect potluck dessert (think Thanksgiving). According to Dorie, this recipe can easily be converted to a deep-dish pie; which I will be doing for my own Thanksgiving. The dough instructions stay the same but the filling changes as follows: 8 apples, a squirt of lemon juice, 3/4 C raisins, 3 TBS sugar and 1 tsp cinnamon. The Katy Perry station on Pandora. It’s not my fault, TD set it. And, he’s passed blame-off to the fluffy Kitchen God. Apparently Balu enjoys the occasional bubblegum pop tune. 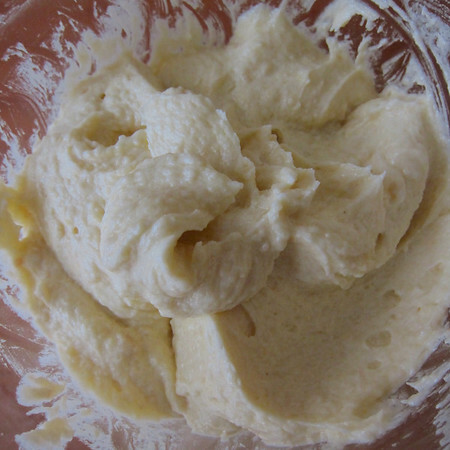 In a standing mixer fitted with a paddle, beat the butter and sugar together on medium speed until smooth, about 2 minutes. Add the eggs and continue to beat until the mixture is light and fluffy, about 3 more minutes. 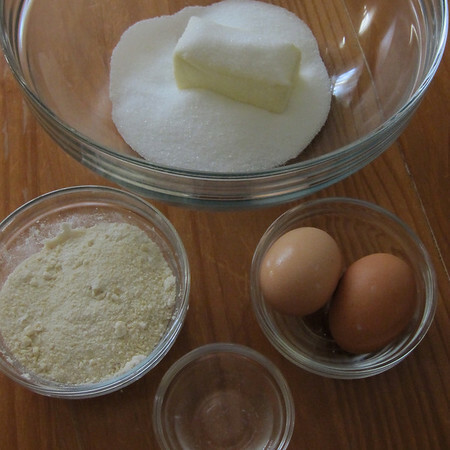 Reduce the mixer speed to low, add the baking powder and salt and mix to just combined. Add-in the lemon juice (don’t worry if the dough curdles). Still working on slow speed, slowly but steadily add 3 1/4 C of flour, scraping down the bowl as needed. 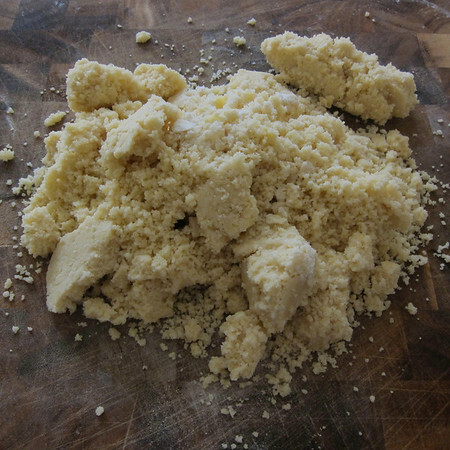 While the dough is meant to be soft, if it looks more like batter than dough, add remaining 1/4 C flour. 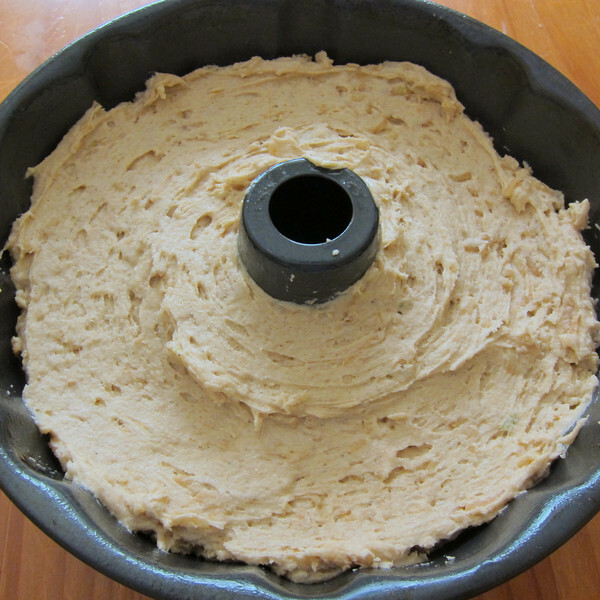 When properly combined, the dough should almost clean the sides of the bowl. 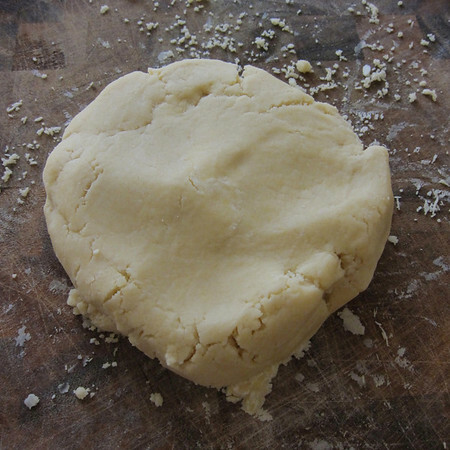 Turn the dough out onto a work surface, gather it into a ball and divide it into half. Wrap the dough in plastic and refrigerate for at least two hours, or up to 3 days. 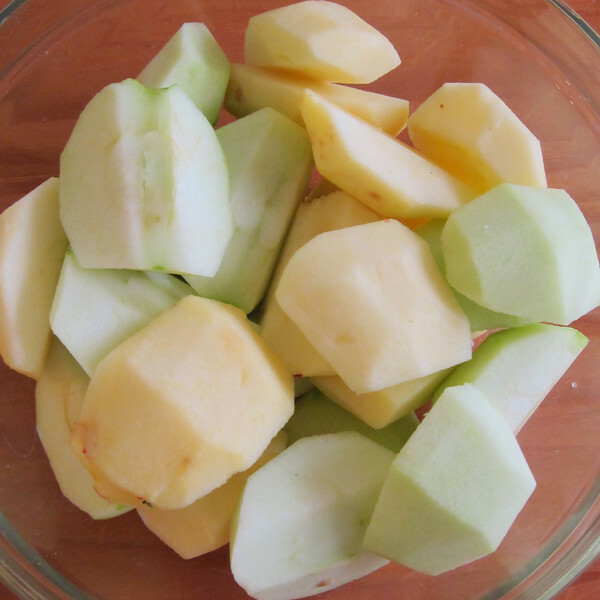 Peel and core the apples and cut into slices about 1/4 inch thick then cut the slices in half cross-wise if desired. Toss the slices in a both with a little lemon juice and add the raisins. 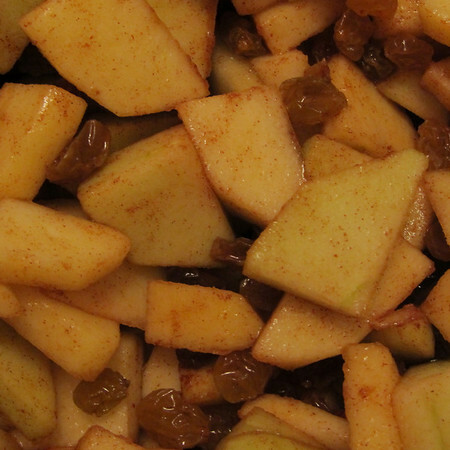 Mix together the cinnamon and sugar, sprinkle of the apples and stir evenly. Taste and apple and adjust sugar as needed. Center rack in the oven and preheat to 375 degrees. 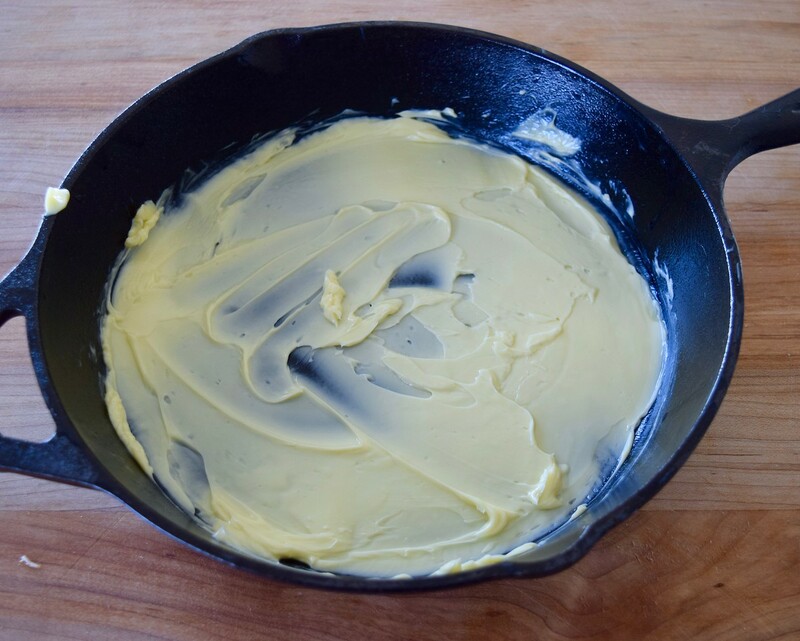 Generously butter and line with parchment a 9X13 inch baking pan. Remove the dough from the fridge. If it is too hard to roll and cracks, let it sit at room temperature for about 15 minutes or give it a few bashes with your rolling pin to get it moving (I did both, very satisfying). 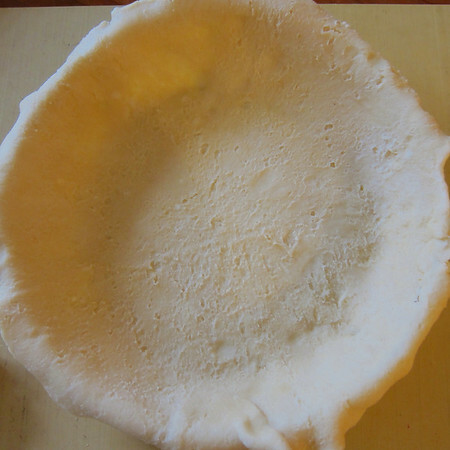 Spread the dough between two layers of parchment and carefully roll dough to about 1/4 inch thick. You can go for the gold and try to roll-out an 11X 15 inch rectangle or you can roll out smaller pieces and patch them together in the pan. Transfer the dough to the pan. 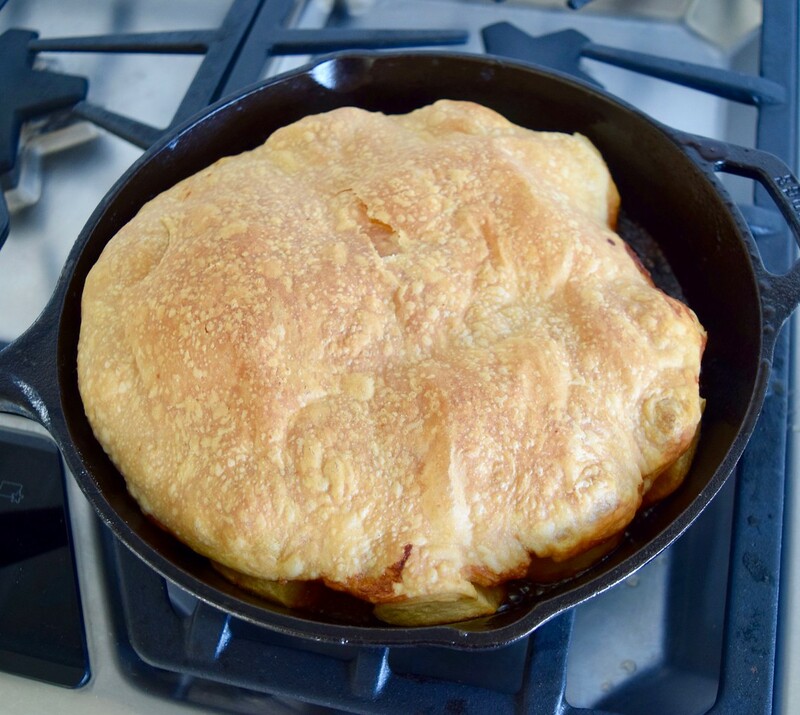 In a perfect world you want the dough to come up the sides a bit–but in the end it doesn’t matter because of the magic and forgiving puff-factor. 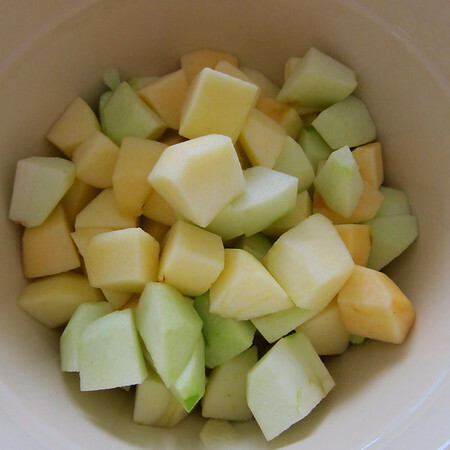 Give the apples another toss in the bowl, then turn them into the pan and evenly spread them across the bottom. Roll-out the second piece of dough and position it over the apples. Cut the dough so you’ve got a 1/4 to 1/2 inch overhand and tuck the excess into the side of the pan, as though you were making a bed. Brush the top of the dough lightly with water and sprinkle sugar over the dough. 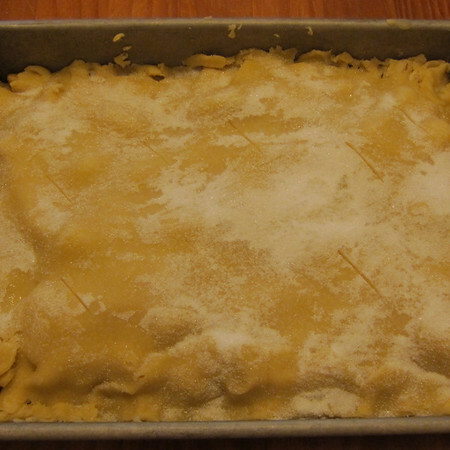 Using a small, sharp knife, cut 6 to 8 evenly spaced slits in the dough. 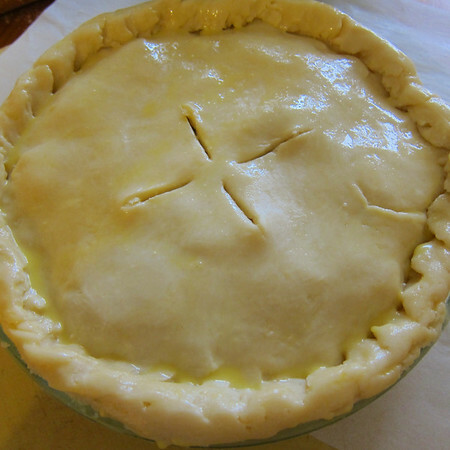 Bake for 65 to 80 minutes, or until the dough is nice and golden and the juices are bubbling up through the slits. Transfer the baking pan to a cooling rack and cool to just warm or room temperature. Cut into squares, diamonds. Do you mind if we stay in Normandy a bit longer? 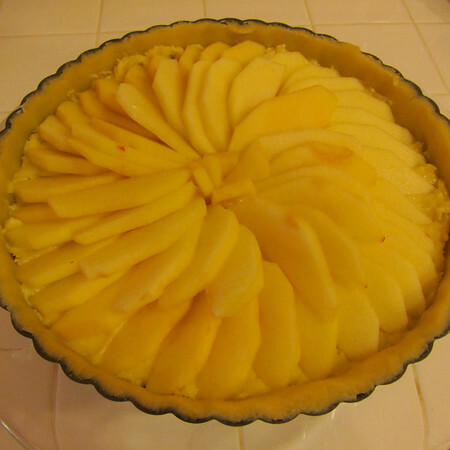 What if I offer another version of tarte aux pommes? As I mentioned last Thursday, TD and I were in France a decade ago. Sadly, we have yet to return, but that isn’t the point of this post. Or maybe it is. You see, TD is a bit of a francophobe. Despite everything having turned out pretty much okay, he still hasn’t gotten over World War II. So, the only way I could get him to actually visit France the first time was to include a trip to the Normandy American Cemetery and Memorial. This really was a win-win situation. He got to stand on what is technically American soil in France and I had an excuse to make sure we spent a couple of nights in Bayeux. I have to admit, I was not expecting the power or emotion of the monument. Perhaps it was that we’d just finished watching HBO’s World War II mini-series Band of Brothers. Or perhaps it was some strange prescience about what was just around the corner as we returned from this trip on September 10, 2001. Either way, the experience left an indelible mark on my reverence for what it means to live in a free democracy. Even after spending the day at the memorial and in the local historical sights, there was plenty to do and see in the area (and what I mean by plenty is like, we should have spent a couple more months there). Bayeux is the home of the Bayeux Tapestry, a seriously long embroidered banner made in the early 9th century depicting some serious European history (hence the serious length). Now, generally, TD and I are all for museums. And, we did walk by the Musee de la Tapisserie de Bayeux several times during our visit. However, the City itself proved too charming a siren and we spent most of our time wandering around enjoying the outdoor markets and quaint architecture. And then there was the Table of Terror. Or at least, that’s what TD saw. I saw La Table du Terroir. Terroir is one of those lovely french words that does not have an English translation. Grossly oversimplified, the word references a variety of geographic, weather and generally excellent karmic conditions that give certain crops their identity. It is often utilized in conjunction with grape varietals. And Halloween. Though terroir and its meaning is significantly more charming, “terror” stuck and we still talk about our meal at the Table of Terror (which was, of course, the exact opposite). 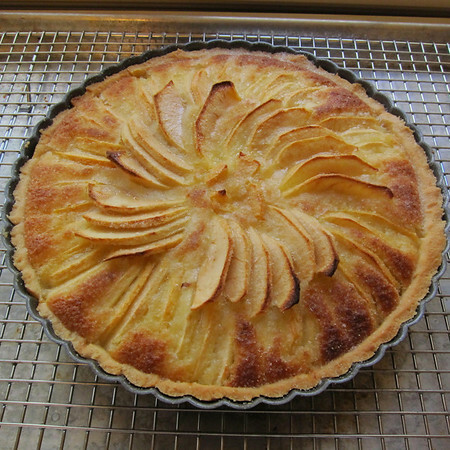 And that brings me to this week’s recipe: tarte normande. Like its sweet and elegant sister tarte aux pommes, tarte normade is crowned with a composed array of thinly sliced apples. 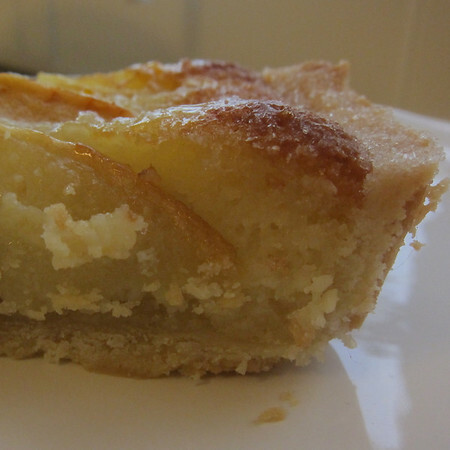 However, instead of more apples underneath, the normande version has a beautiful layer of frangipane. Frangipane is sort of like an almond custard. It is nutty, but also somehow manages to be both light and rich. It is incredibly versatile and equally delicious with apples, berries or stone fruit. Unlike last week’s press-in sweet tart dough, this tarte starts with a more savory rolled-dough. 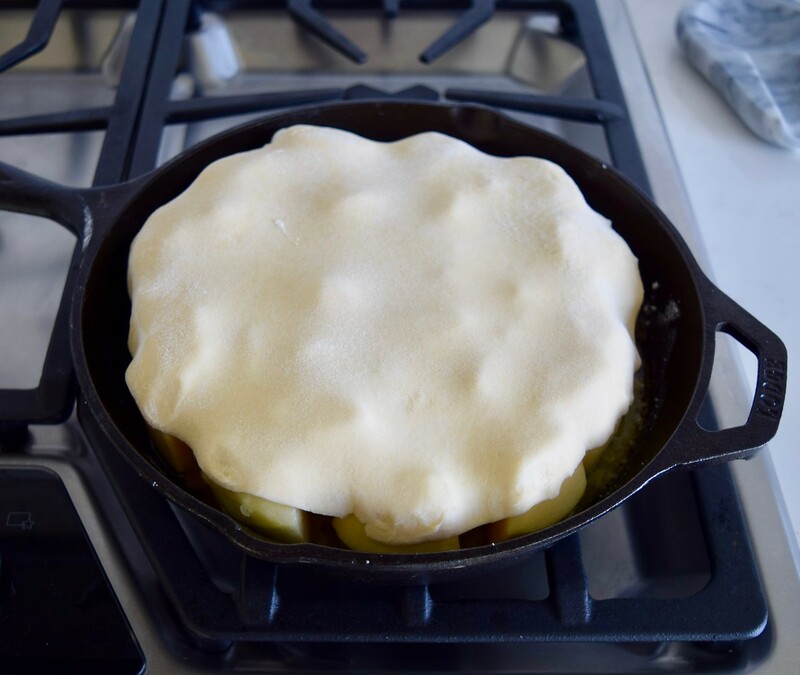 Since you are only using a single crust, the dough can easily be rolled, carefully transferred into a tart pan and then refrigerated or even frozen (be sure to wrap in plastic) in advance. While your dough is in the fridge, it’s time to make the frangipone. Which brings us back (once again) to almond meal. Make your own or buy it, either way, you’ll need about 2/3 of a cup. Pulsed together in the food processor, the finished product is sort of like a gritty whipped frosting (well, not finished product, I don’t know if anyone would eat this stuff raw). 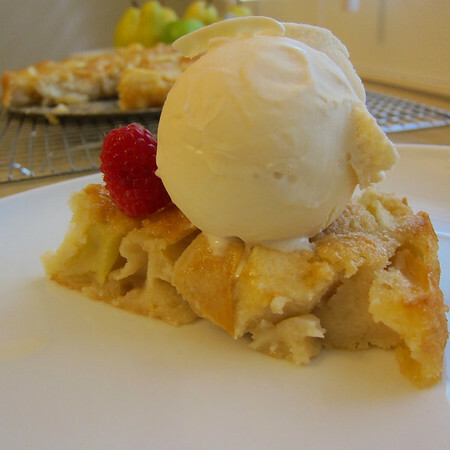 The frangipone can also be made in advance and kept in the fridge for a day or two. 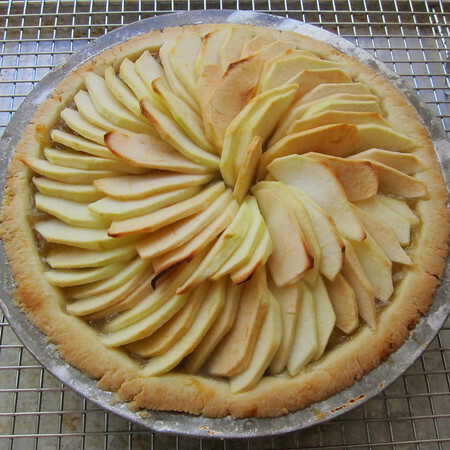 Once you are ready to assemble the tart, spread the frangipone evenly in the bottom of the tart. 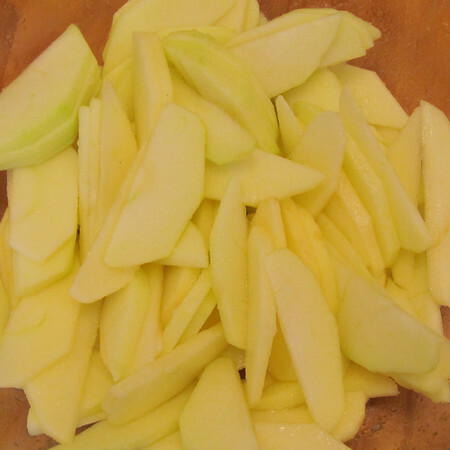 Then, a nice layer of thinly sliced apples is arrange on top followed by a generous sprinkle of sugar. Then, bake until toasty. Your apples will sink-into the tart a little bit. 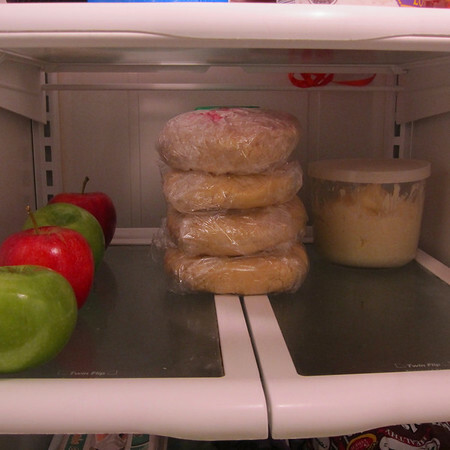 For this reason, I suggest cramming as many apple slices into your arrangement as you can possibly fit. The final step is a light brushing of apricot preserves (melted) if you so desire. 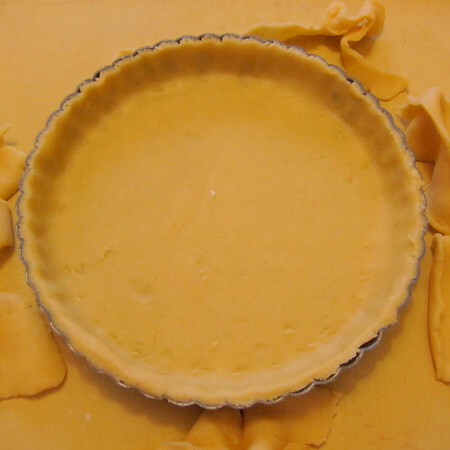 You’ll want to let the tart cool before serving so that you can easily remove the tart ring. However, it would taste pretty amazing slightly warmed with a scoop of vanilla ice cream (or caramel, or chocolate or….) or maybe some scratch whipped cream. Not that I would admit to it, but this little tart tarte makes an excellent breakfast with a strong cup of black coffee. Adele. Both albums. One playlist. 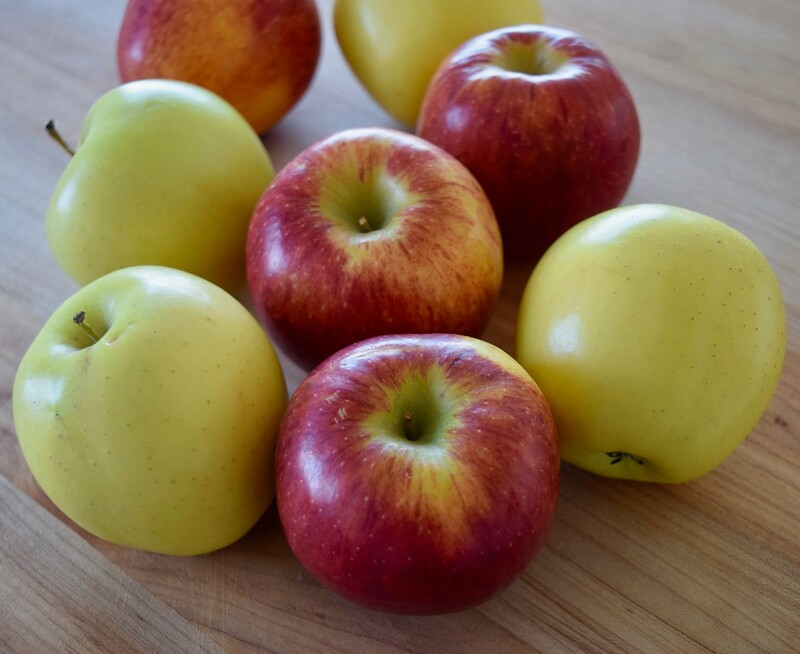 An apple a day leads to…100 posts! Apple of my eye. How about them apples? The apple doesn’t fall far from the tree. Don’t upset the apple cart. It’s like comparing apples and oranges. The big apple. Criss-cross applesauce! An apple for the teacher. 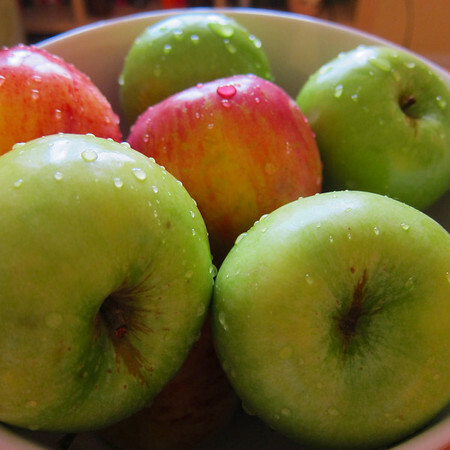 Now that we’ve got that out of the way, let’s move on to a month of apples. To tell the truth, I was feeling a little uninspired in the baking department. However, a friend and colleague (thanks GMS!) 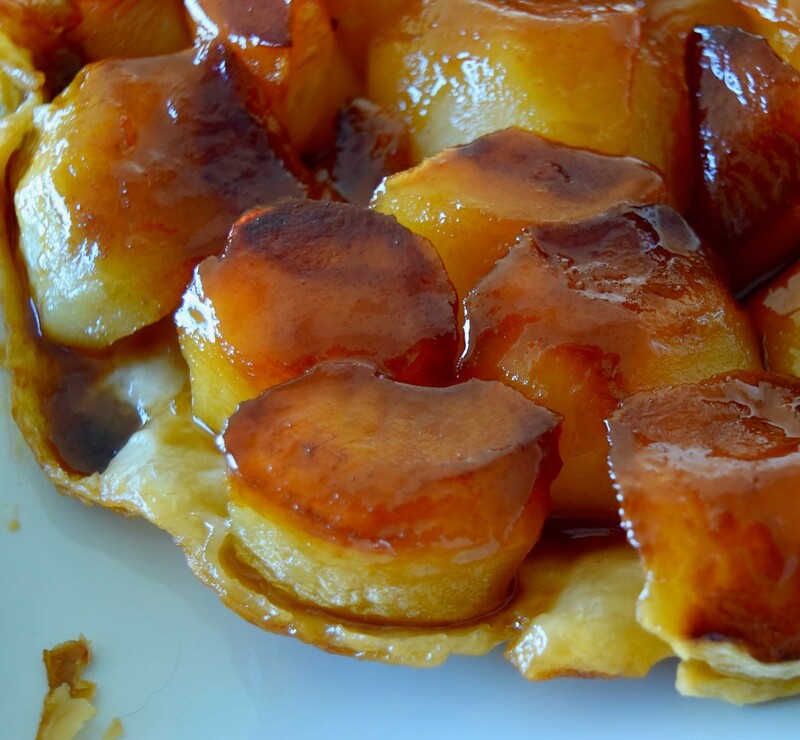 made a simple suggestion: tarte aux pommes. Suddenly, I was back in Bayeaux Normandy in early fall just about a decade ago. The air was crisp, the camembert ripe et les pommes? Sigh. 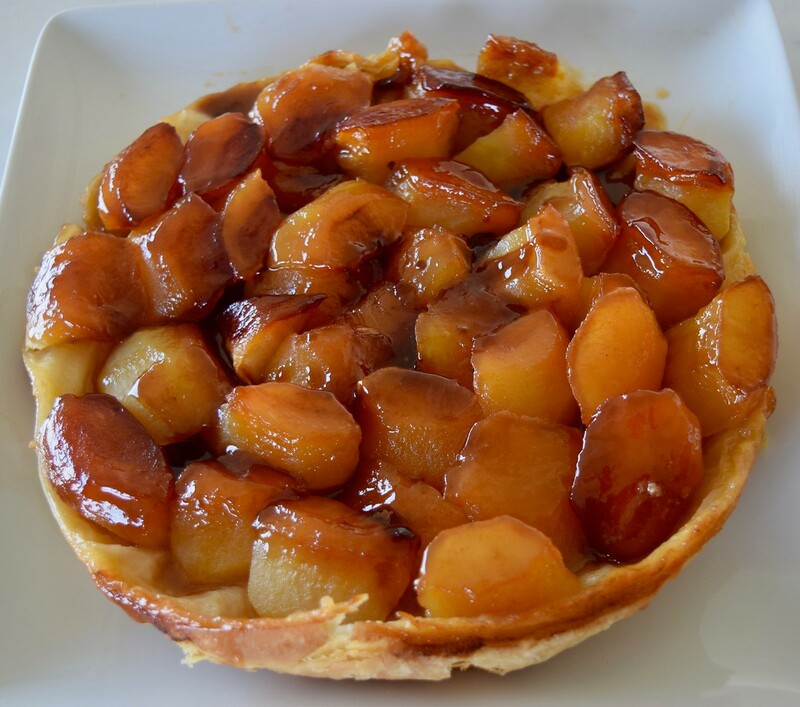 Like its cousin, the apple pie, tarte aux pommes has numerous equally delicious incarnations. But, let’s start with tradition. With a twist. 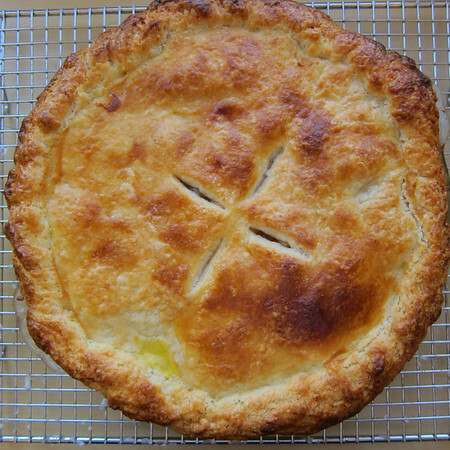 I’ve been experimenting with pie and tart crust. 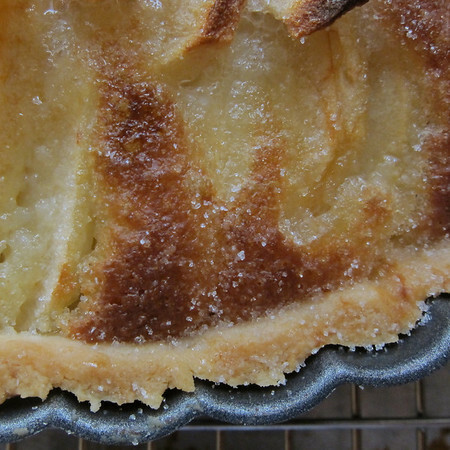 So, this tart started with Dorie Greenspan’s sweet tart dough. 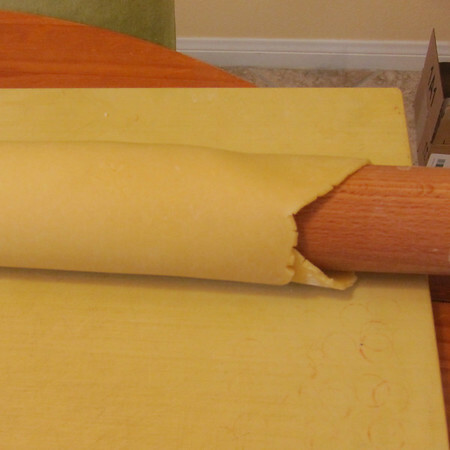 This is a press-in dough, so if you fear the rolling pin, this is a good option. This is also a sweeter dough than some and so, pairs well with tart (as opposed to tarte) flavors. Simple ingredients get combined in the food processor. Once sandy, turn the mixture onto a lightly floured surface, and anything that didn’t get combined in the processor gets a light kneed. 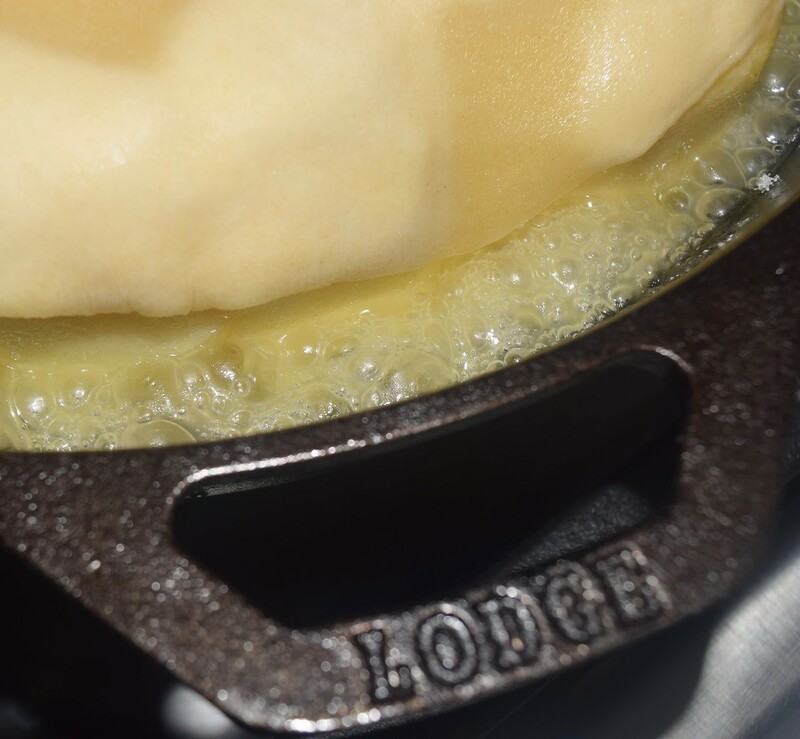 From here, the dough can be pressed directly into your tin, pan or mold. Or, wrapped securely in plastic and chilled until needed. From Dorie, we now switch to Julia and peel four pounds of apples. She recommends golden delicious. I used a combination of Granny Smith, Gala and golden. Three cups get sliced into pretty 1/8 inch disks. The rest are cut into chunks. 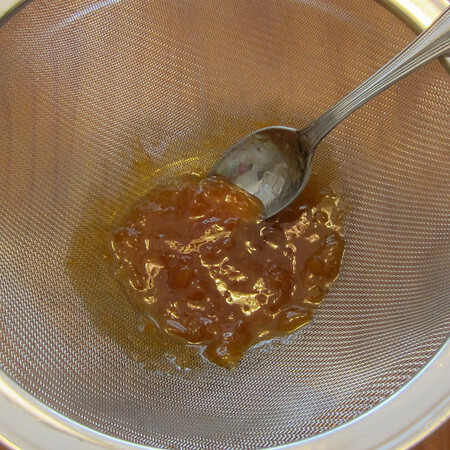 In the meantime, push all of the preserves through a sieve. The result will be a gorgeous glaze. 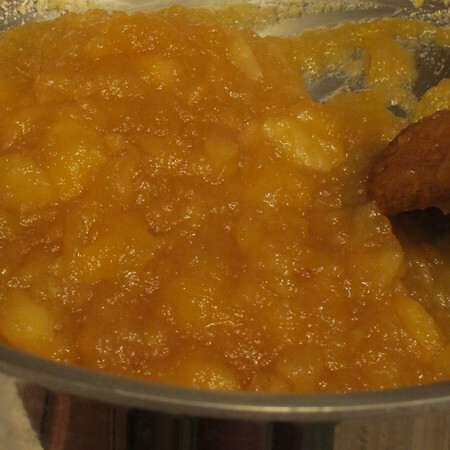 Mix 1/3 of the apricots with sugar and apple brandy or cider. Set aside. Now it’s time for the sauce. 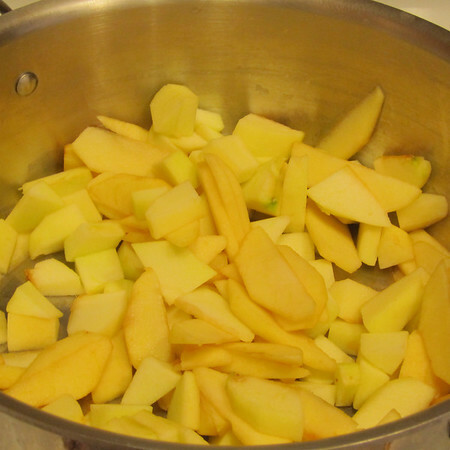 Add apple chunks to a heavy saucepan. Cook on low for about 20 minutes. Until the apples are tender. 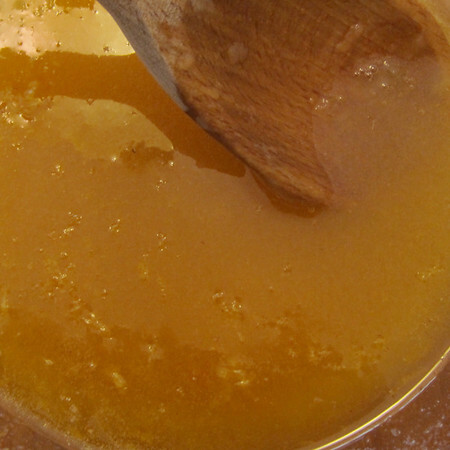 Increase heat and mix-in the preserves mixture and butter. Bring to a boil. 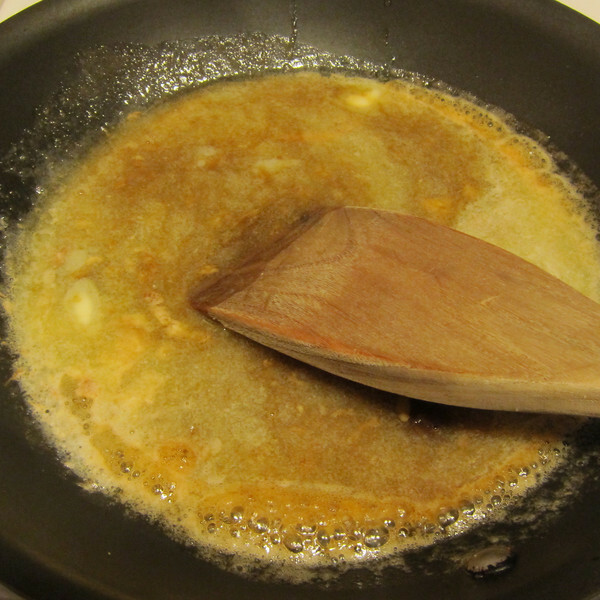 And stir constantly until the sauce holds a mass on the spoon. Then, into the cold tart shell (I’ve used a pie tin here because my tart pan was otherwise occupied. I mean come on, it is a tart pan). Arrange the apples on top. 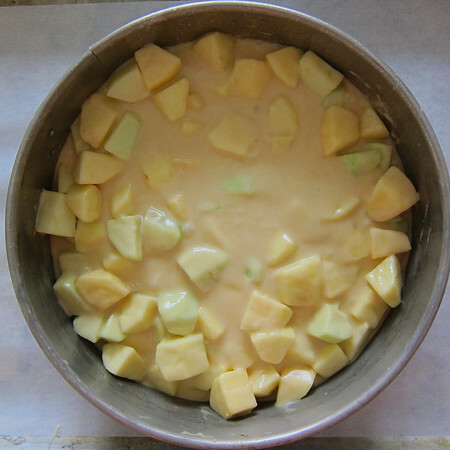 And, into the oven until the crust and apples are slightly browned. As a final step that I somehow forgot to photograph, lightly brush the remaining preserves over the top of the tart. Enjoy warm or at room temperature. And with that, I close my 100th post. Ooh la la! Coldplay. Don’t know what it is about them or me lately, but they sure hit the spot. Put flour, sugar and salt into a food processor and pulse a couple of times to combined. 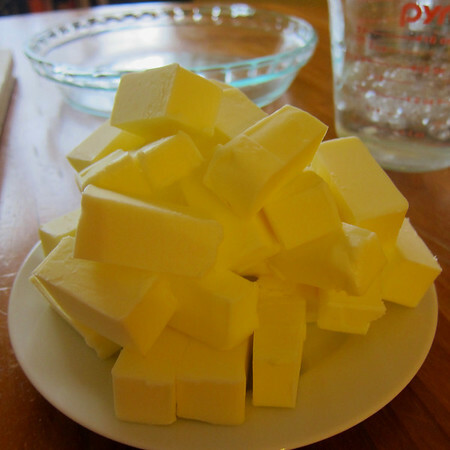 Scatter butter pieces over the dry ingredients and pulse until the butter is coarsely cut-in. 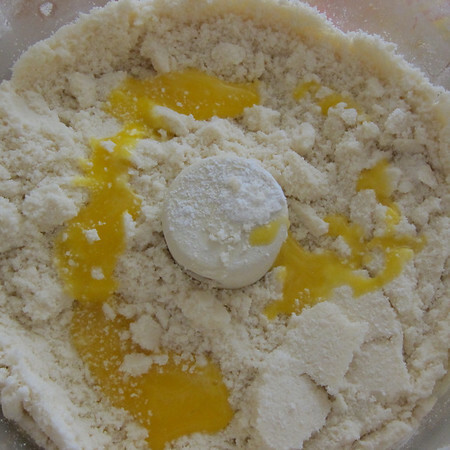 Stir the yolk to break it up and then gradually add to the mixture, pulsing in between until the dough becomes sandy and and forms clumps and curds. Turn dough out onto lightly floured surface and kneed gently to incorporated any unmixed ingredients. Butter a nine-inch fluted tart pan (or in my case, a pie tin as my tarte pan was in use at the time). Press the dough evenly into the pan and up the sides of the pan. 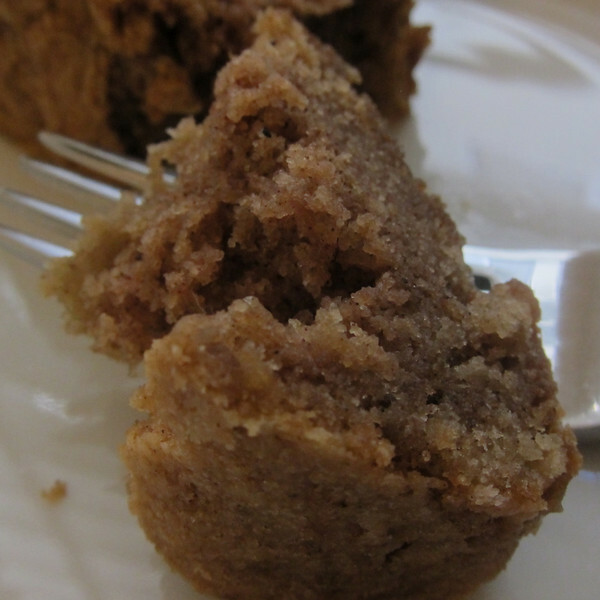 (TMH note–using the bottom surface an 8 ounce measuring cup is useful in smoothing down the dough, just don’t press too firmly otherwise the dough loses it’s crumbly texture). Freeze the crust for at least 30 minutes. Or, refrigerate over night. Peel, core and quarter the apples. Cut enough to make 3 cups into even 1/8 inch lengthwise slices and toss them in a bowl with the lemon juice and first 2 TB sugar. Reserve for the top of the tart. 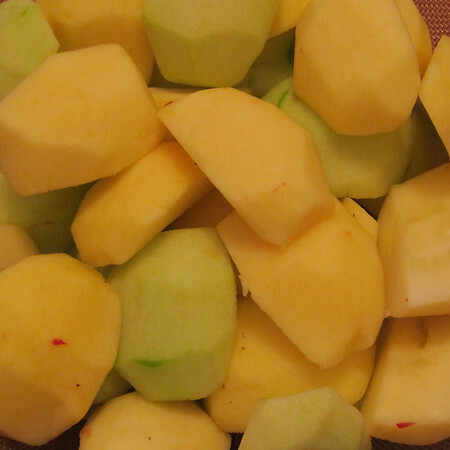 Cut the rest of the apples into rough slices. 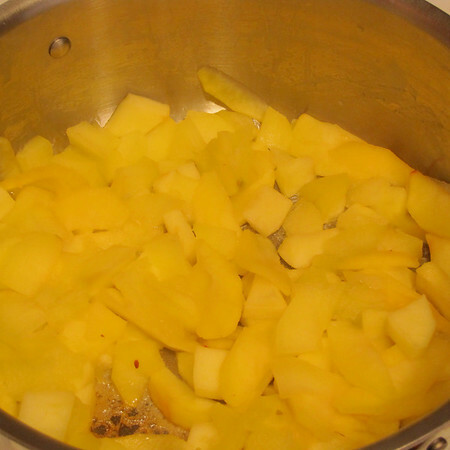 Place remaining apples in a heavy saucepan and cook, covered over low heat for 20 minutes, stirring occasionally until tender. Beat in the first 1/3 C apricot perserves, butter, remaining sugar and lemon zest. 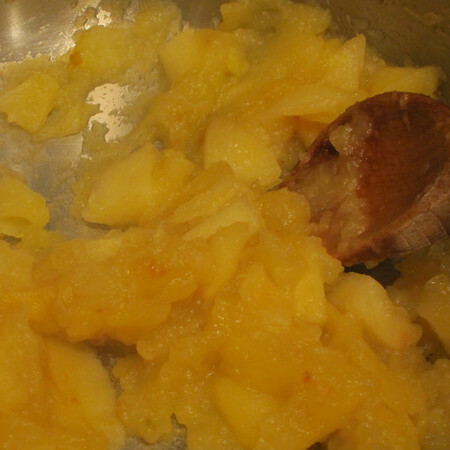 Raise heat and boil, stirring until apple-sauce is thick enough to hold in a mass in the spoon. 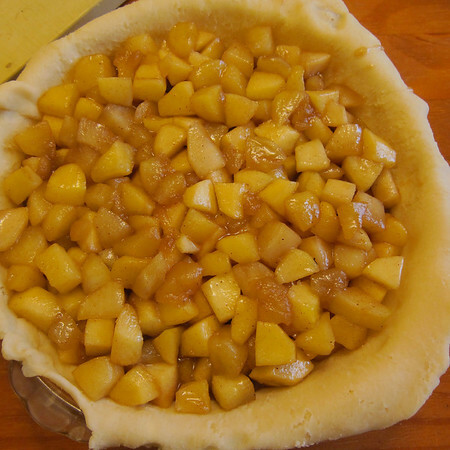 Remove crust from fridge and spread the applesauce in the shell. 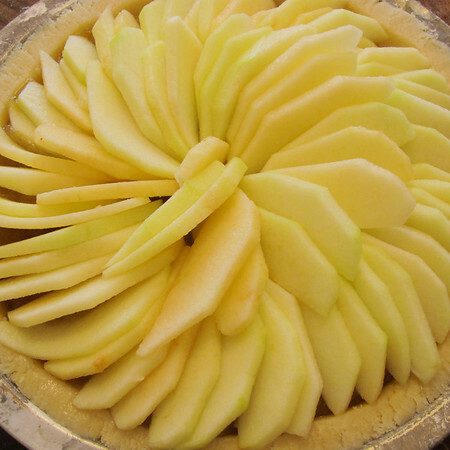 Cover with a neat, closely overlapping layer of sliced apples arranged in a spiral or concentric circles. 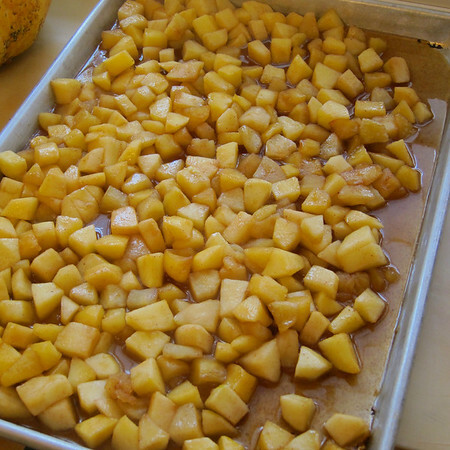 Bake in upper third of over for about 30 minutes or until the sliced apples have browned lightly. Slide tart onto a rack or serving dish and spoon or paint over it a light coating of melted apricot preserves.